Liczba stron: 26 Jest to ujednolicona liczba stron, która ułatwi Ci porównanie długości książek. Każda strona Legimi to 200 słów. Readers of The Alice Network: A Novel seeking engagement for all reading groups can gain further insight with this essential resource as a guide to aid your discussions. The Alice Network is a historical fiction novel that brings the readers back to the Great War. Author Kate Quinn tells a story of two women in wartime Europe. One is an American socialite Charlie St. Clair. Her pregnancy forces her to leave her country and move to Europe in search of a cousin who disappeared in France during the Nazi occupation. The second is a female spy Eve Gardiner who became a part of France’s Alice Network during the Great War. Their stories intertwine in this exciting tale by Kate Quinn. 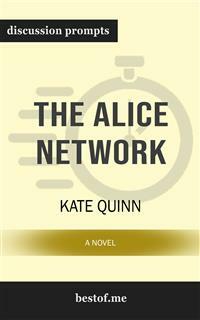 2017 is a good year for Kate Quinn’s The Alice Network. This novel boasts of its recognition as New York Times & USA Today bestseller. It has also been acclaimed #1 Historical Fiction Bestseller by Globe and Mail. It has been part of NPR’s 2017 Best Books of the Year, Girly Book Club and Bookbub’s Biggest Historical Fiction Books of the Year. Celebrity Reese Witherspoon picked The Alice Network for her esteemed book club. Lastly, The Alice Network became the official Summer Book Pick for Good Housekeeping, Parade, Library Journal, Goodreads, Liz and Lisa, and BookBub. In this comprehensive look into The Alice Network: A Novel , you'll be equipped to prepare with the following: Discussion aid which includes a wealth of prompts and information Overall plot synopsis and author biography Thought-provoking discussion questions for a deeper examination Creative exercises to foster alternate “if this was you” discussions And much more! Note to readers: This is a companion guide based on The Alice Network: A Novel This is meant to enhance and aid your reading experience, not to replace it. We strongly encourage you to purchase the original book before purchasing this unofficial companion guide. Please Note: The book you are about to enjoy is an analytical review meant for educational and entertainment purposes as an unofficial companion. If you have not yet read the original work, please do before purchasing this copy. Copyright © 2018 by bestof.me. All Rights Reserved. First Published in the U.S.A.
Have you ever wanted to improve your understanding of The Alice Network? Or perhaps you are simply struggling to learn the subject matter? It’s a simple teaching technique that helps students learn and readers to grow. With versatile discussion questions for each major criteria regarding The Alice Network, these discussion prompts are designed to help surface crucial discussions that are capable to assist toward thinking and learning on a deeper level. Whether you’re an avid learner set out to reach the best for yourself, or a student struggling to learn the subject matter, these discussion prompts can get you to actively respond as you question, analyze, relate, and reflect. We hope that our readers will be able to become the best of themselves, in whatever good pursuit, with this edition of bestof.me.